Deque in Java is an interface present in java.util package. The Deque interface in Java was added by Java 6 version. It extends the Queue interface and declares the behavior of a double-ended-queue. In Deque we can add or remove elements from both sides of the queue. The Deque can function as standard, first-in, first-out queues or as last-in, first-out stacks. The Deque doesn't allow you to insert the null element. LinkedList and ArrayDeque are the two implementation class of the Deque interface. 1. add(E e): This method is used to insert specified element to the tail. 2. addFirst(E e): This method is used to insert specified element to the head. 3. addLast(E e): This method is used to insert the specified element to the tail. 4. E getFirst(): This method returns the first element in the deque. 5. E getLast(): This method returns the last element in the deque. 6. offer(E e): This method adds an element to the tail of the deque and returns a boolean value. 7. offerFirst(E e): This method adds an element to the head of the queue and returns a boolean value if the insertion was successful. 8. offerLast(E e): This method adds an element to the tail of the queue and returns a boolean value if the insertion was successful. 9. removeFirst(): It removes the element at the head of the deque. 10. removeLast(): It removes the element at the tail of the deque. 12. pop(): It removes the element from the head and returns it. 13. poll(): returns and remove the head element of the deque. 14. pollFirst(): returns and remove the first element of the deque. It returns null if the deque is empty. 15. pollLast(): returns and remove the last element of the deque. It returns null if the deque is empty. 16. peek(): return the element at the head of a deque but not removed. It returns null if the deque is empty. 17. peekFirst(): return the first element at the head of a deque but not removed. It returns null if the deque is empty. 18. peekLast(): return the last element at the head of a deque but not removed. It returns null if the deque is empty. /*return the element at the head of a deque but not removed. //returns and remove the head element of the deque. /* returns and remove the first element of the deque. 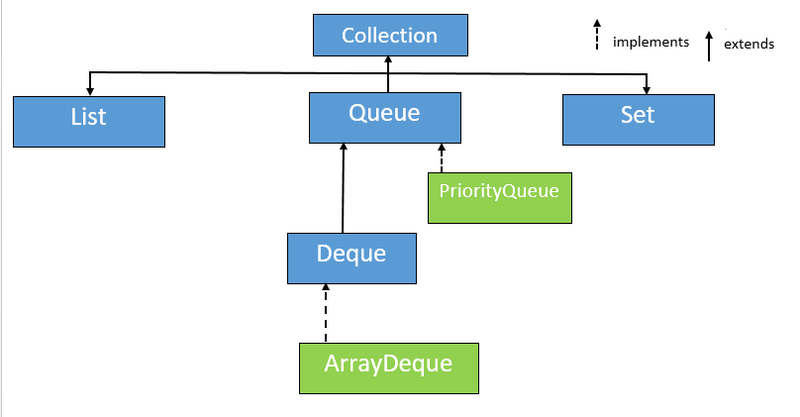 How to implement PriorityQueue in Java? How to implement a stack in java? How to add and remove elements in the ArrayList?